As the Ebola virus continues to dominate the news, it is important to think not only about the immediate consequences of Ebola in West Africa and how to stop its spread, but also the long-term impacts of the disease. Health crises like this have a trickle-down effect, and impact not only healthcare systems but also wages, food security, and entire economies. GeoPoll has previously conducted food security surveys with the World Food Programme, assessing food security in the DRC and Kenya using text message surveys, and now GeoPoll and the WFP are looking at how Ebola has effected food security in key areas in Sierra Leone, Guinea, and Liberia. This month we started a 3-month round of data collection in the 3 countries looking at food security in Ebola epicenters and the surrounding areas. Mobile data collection allows for research to be done in areas which can’t be accessed by on-the-ground researchers, which is why the WFP has parterned with GeoPoll to send food security surveys through text and voice messages. 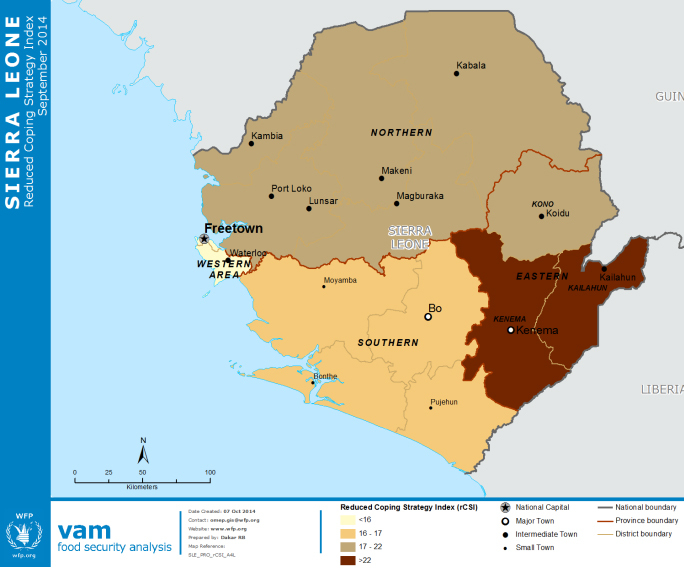 The first results, from Sierra Leone, were released earlier this month, and demonstrate that people in the two Ebola epicenters are worse off in terms of food security and wages than in the surrounding areas. Those living in Kailahun and Kenema have higher scores on the reduced Coping Strategies Index, indicating they use severe food coping strategies more often, restricting portion size and buying less expensive food more than those in neighboring regions. The wages for casual workers in these two areas are also significantly less than in the rest of the country, likely affecting the food security situation. You can read the full report on the food security sitation in Sierra Leone here, and check back for data from Guinea and Liberia, which will be released in the next few weeks.